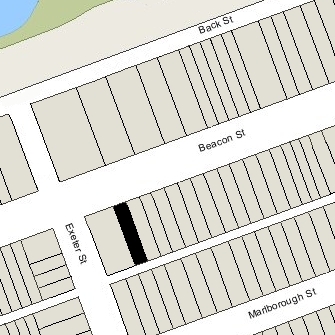 293 Beacon is located on the south side of Beacon, between Dartmouth and Exeter, with 291 Beacon to the east and 295-297 Beacon to the west. 293 Beacon was designed by architect Edgar C. Curtis and built in 1884 by Morton and Chesley as the home of cotton buyer Edward Gray and his wife, Elizabeth Gray (Story) Gray. They previously had lived at 225 Beacon. They also maintained a home in Newport. Edward Gray is shown as the owner of 293 Beacon on the original building permit application, dated May 15, 1884. He acquired the land for the house on April 15, 1884, from dry goods merchant Eben Dyer Jordan, co-founder of the firm of Jordan, Marsh & Company. He and his wife, Julia M. (Clark) Jordan, lived at 46 Beacon. Eben D. Jordan had been conveyed the land one week earlier, on April 9, 1884, by the Commonwealth of Massachusetts. The land originally had been sold by the Commonwealth at its public sale on November 26, 1866, and Eben Jordan either was the successful bidder at that time or acquired the right to purchase it from the successful bidder, but in either case did not complete the transaction until he had a buyer to whom he could sell it. Click here for an index to the deeds for 293 Beacon. The Grays continued to live at 293 Beacon during the 1887-1888 winter season. By the 1889-1890 season, they were living with his parents, William and Sarah (Loring) Gray, at 20 Mt. Vernon, and by the 1891-1892 winter season, they were living at 117 Beacon. By the 1888-1889 winter season, 293 Beacon was the home of Henry Denison Burnham and his wife, Johanna Barbara (Heckscher) Burnham. They had been married in April of 1888, and 293 Beacon probably was their first home together. Prior to their marriage, he had lived at 21 Commonwealth with his mother, Jane Isabel (Denison) Burnham, the widow of John Appleton Burnham. Henry Burnham was a trustee of estates. Henry and Johanna Burnham continued to live at 293 Beacon during the 1891-1892 winter season, but moved thereafter and were living at 183 Marlborough by the 1893-1894 season. On May 24, 1892, 293 Beacon was acquired from Edward Gray by his father-in-law, attorney Franklin Howard Story, Jr. He and his wife, Adeline (Wainwright) Story, lived in Westchester, New York. Edward and Elizabeth Gray separated at about this time. By June of 1892 (when their daughter, Esther, was born), 293 Beacon was the home of cotton mill owner Horatio Nelson Slater and his wife, Mabel De Carteret (Hunt) Slater. They had married in September of 1891. They also maintained homes in Magnolia and in Webster, where several of his cotton mills were located. They continued to live at 293 Beacon during the 1892-1893 winter season, but by the 1894-1895 season were living at 315 Dartmouth. 293 Beacon was not listed the 1894 Blue Book. On April 24, 1894, 293 Beacon was purchased from Franklin Story by textile manufacturer Harcourt Amory. He and his wife, Gertrude Lowndes (Chase) Amory, made it their home. They previously had lived at 251 Beacon. Harcourt and Gertrude Amory raised their three children — Gertrude Livingston Amory, Harcourt Amory, Jr., and John Singleton Amory – at 293 Beacon. Gertrude Amory married in April of 1915 to Constantine Hutchins, a banker, and they moved to Needham. Harcourt Amory, Jr., an investment broker, married in February of 1923 to Susannah Stoddard Wood. After their marriage, they lived with Harcourt and Gertrude Amory at 293 Beacon until late 1925, when they moved to the Hotel Hamilton at 260 Clarendon and then to 174 Marlborough. Harcourt Amory died in November of 1925. Gertrude Amory continued to live at 293 Beacon with their son, John. She also maintained a home in Prides Crossing. John Amory married in February of 1931 to Mary Buttrick. After their marriage, they lived in Wenham. Gertrude Amory continued to live at 293 Beacon until about 1936, when she moved to the Hotel Agassiz at 191 Commonwealth. On July 15, 1936, 293 Beacon was purchased from Gertrude Amory by David Stulin, trustee of the Marlborough Realty Trust, a real estate investment trust formed by David Stulin, Hyman Sirota, and George Bernard Rittenberg. David Stulin was a carpenter; he and his wife, Annie (Rosen) Stulin, lived in Dorchester. Hyman Sirota (Chaim Sirotkin) also was a carpenter; he and his wife, Rebecca (Rivka) (Epstein) Sirota, lived in Mattapan. George Rittenberg was a lawyer; he was unmarried and lived in Roxbury with his mother, Lena (Solomon) Rittenberg, the widow of Joseph Rittenberg. In June of 1936, prior to taking title to the property, the trust applied for (and subsequently received) permission to convert the property from a single-family dwelling into ten apartments. David Stulin died in July of 1946. His son, Jacob (Jack) R. Stulin, succeeded him as trustee (having been appointed in May of 1946). On February 28, 1948, 293 Beacon was acquired from the beneficiaries of the Marlborough Realty Trust (David Stulin’s heirs, Hyman Sirota, and George Rittenberg) by Hyman Sirota’s wife. Rebecca (Epstein) Sirota. The property subsequently changed hands, remaining an apartment house, and on March 29, 1985, was purchased by Catherine Pinkham, trustee of the 293 Beacon Realty Trust. 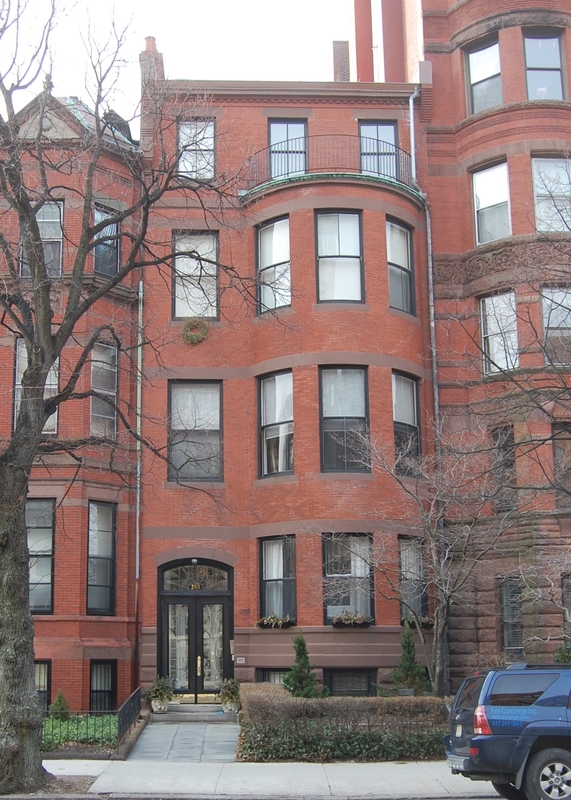 On April 29, 1985, she converted the property into ten condominium units, 293 Beacon Street Condominium.